There is all types of engineers out there and each of them can vary in personalities. But like all men they are simple. You really don't need to over think things with them, they are very honest and to the point. But like with any man they have their needs as do women. When dating an engineer you have to remember they think analytical and practical. 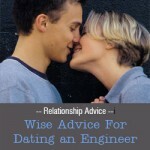 Logical thinking will … [Read more...] about The Do’s and Don’ts of Dating an Engineer.